Revlon Hair Tools Review: Are they The Best Hair Styling Tools? 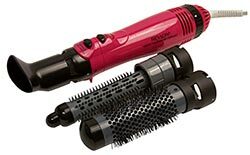 Revlon hair tools are products made by Revlon Company. The firm started operating in 1932 with nail color as its product. Since then, they have grown to be among the leaders in the beauty production industry. Revlon has quite a number of subsidiary companies, which have the task of providing a range of different kinds of personal care products. Revlon has a range of hair dryers that caters for different types of hair. There is the hand dryer, a curling brush with an inbuilt air dryer, a brush with an inbuilt dryer and much more. Hand dryers often come in different strengths and sizes, and can assist you dry any kind of hair for whichever situation. Just to mention a few, Revlon offers curling irons that come in different styles and sizes, hence offering a wide range of curl styles and textures. These irons have barrels with different sizes for different kind of curl sizes. Revlon offers different styles of brushes for short hair styles. The Flat Iron Revlon provides a range of flat irons that come with different heat conducting materials. Hence, enabling anyone with different type of hair access a flat iron that works well with him or her. Every iron has an adjustable heat setting and come in different sizes for convenience purposes. The One-step hair dryer is a two-in-one product that has a dryer and a brush, hence allowing you to dry your hair while simultaneously making curls. Revlon offers more than forty different kinds of hair tools. Each has different functions when it comes to styling. They also those meant for a particular hair type i.e. Teasers, regular brushes, roller brushes, combs etc. For instance their volumizer and hair dryer, curls the hair while drying it, thus a good styling tool. For the case of Revlon one step hair dryer all you need to do is wash your hair, let it dry up for about twenty minutes before using the hair tool. Depending with the type of hair, you can touch it up with a Revlon flat iron for those who want super straight results. There are not so many side effects surrounding the use of Revlon products. However, long-term use of hair driers, without regulating the heat may result to hair weakening. When the straightening technique is done incorrectly, it can be quite dangerous as it may result to permanent hair damage. However, most hair experts and salons are rather cautious with the procedure. The side effects often vary depending with an individual’s hair quality. It is important to first identify your type of hair and know the drawback associated with certain hair tools. Considering the reputation Revlon has managed to build over the years, there is limited room left to question their quality level. For those who want to purchase Revlon hair tools and other beauty products or even get a few questions addressed, care to visit their social media sites or their brand website.